TWO knifemen who had pledged allegiance to Isis forced two nuns to watch as they filmed themselves slitting the throat of a French priest while they performed "a sort of sermon", it has emerged. The two killers reportedly demanded 86-year-old Father Jacques Hamel kneel before them while they carried out the atrocity at the church at Saint-Étienne-du-Rouvray, near Rouen. He had retired aged 75 but helped out when necessary - and was reportedly standing in for the regular priest, Father Auguste Moanda-Phuati, when two men wielding knives burst into the church at 9.43am French time on Tuesday. He was killed in front of two nuns and two worshippers after all five were taken hostage. Speaking on RMC - a French radio station, Sister Danielle, who escaped the scene said: "They forced him to his knees. He wanted to defend himself. And that's when the tragedy happened." "They recorded themselves. They did a sort of sermon around the altar, in Arabic. It's a horror," she later told BFM television. Sister Danielle - who described the clergyman as a "great priest" - said she fled at the moment the attackers killed him. Born in the Rouen area, Father Hamel was ordained in 1958 and was assistant priest in the parish of St Etienne. His killing has prompted calls for a fast-tracked sainthood for murdered clergyman. Italian politician Roberto Maroni urged the Pope to make the him 'St Jacques'. In an appeal circulated on social media, the president of the Lombard region said: "Father Jacques is a martyr of faith". The hashtag #saintosubito - #saintimmediately - began trending on Twitter as people expressed horror at the incident. One neighbour told weekly French magazine L'Express: "This was a man who did his job to the very end. He was old, but always available for everyone. He was a good priest. He had been here for many years; he lived in the rectory here. Many parishioners knew him very well." A statement issued by the archdiocese of Rouen said. "This man was a good man." Eulalie Garcia, who works in a beauty parlour on the same road as the church, told reporters he had taught her about Catholicism as a young girl. "My family has lived here for 35 years and we have always known him," she said. "He was someone who was treasured by the community. He was very discreet and didn't like to draw attention to himself." French newspaper Le Figaro reported the church was suspected to have been on a list of Catholic places of worship in the area around Paris drawn up as possible targets by Sid Ahmed Ghlam, an Algerian student arrested last year on suspicion of murdering a mother-of-one during a botched attempt to attack a church in Villejuif. Confirming Father Hamel's death, the Archbishop of Rouen, Dominique Lebrun, who cut short a visit to Poland to return to his diocese, said: "I cry to God with all men of good will. The only arms which the Catholic Church can take up are prayer and brotherhood between men." 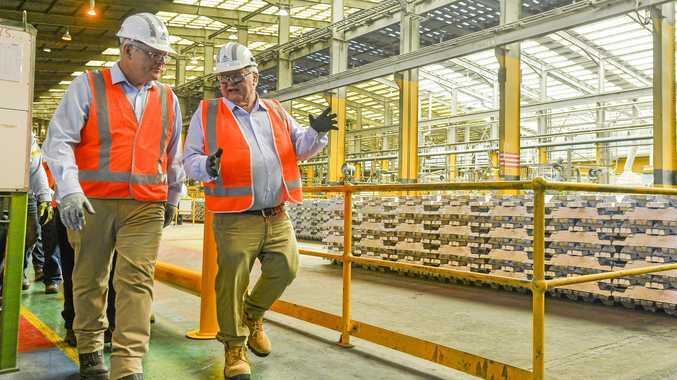 Politics AS the climate policy debate heats up, some within the aluminium industry have concerns about the lack of information surrounding Labor's action plan.